Montreal, Feb. 22, 2018 – Quebec Iron Ore Inc. (“QIO”), a Champion Iron Limited (ASX:CIA)(TSX:CIA)(“Champion” or the “Company”) subsidiary, is pleased to announce that the first train being loaded with 16,500 metric tonnes of high-grade 66% Fe iron concentrate from QIO’s Bloom Lake Iron Ore Mine (“Bloom Lake”) will leave the mine site today, which is located near Fermont, Quebec. The first train (see picture below) represents a tangible step towards realizing Bloom Lake’s potential to become a major supplier of high quality iron ore to global markets. The decision to restart production at Bloom Lake was announced on November 15, 2017, and operations recommenced at the plant on February 16, ahead of schedule and within budget. For the restart, a major operational focus involved optimizing the separation circuit to materially improve the ore recovery rate, and the concentrate transported today demonstrates that QIO has been successful in achieving this important objective. With a CAPEX of CAD326.8 million, including CAD157.2 million spent on upgrades ahead of the mine restart, Bloom Lake is a large-scale project which is set to bring about a new era of prosperity to Quebec’s North Shore region. As detailed in the March 17, 2017 Bloom Lake Mine Feasibility Study (“Feasibility Study”), a copy of which is available under the Company’s profile on SEDAR (www.sedar.com), the Mineral Reserves for the mine are estimated at 411.7 million tonnes and the mine is forecast to generate more than CAD15.1 billion in revenue over the next 20 years, underlining Bloom Lake’s potential to be one of the region’s leading long-life iron ore mines and a major contributor to both the Quebec and Canadian economies. “Significantly, the first train confirms we have been able to produce a high-grade iron concentrate of exceptional quality, as outlined in the mine’s Feasibility Study. Furthermore, not only are we on schedule and within budget, but with current iron ore prices of US$78 pmt for 62% Fe being substantially higher than the estimates of US$56 pmt used in our planning, we are already ahead of forecast. This is an outstanding result,” Executive Chairman and CEO of QIO and Champion, Michael O’Keeffe said. As an indication of the potential economic impact of the project, QIO has already hired 400 mining professionals and support services employees and contractors, with the ultimate target of employing more than 450 men and women at Bloom Lake. “The first train represents a major achievement for QIO, and was only possible with the commitment of all stakeholders including the local community and the support of government. I would also like to recognize the hard work of all staff and contractors now employed at Bloom Lake in helping to deliver this,” Mr O’Keeffe added. Bloom Lake has rail loop infrastructure on-site consisting of a 31.9km rail spur, and has access to end markets via rail and port. 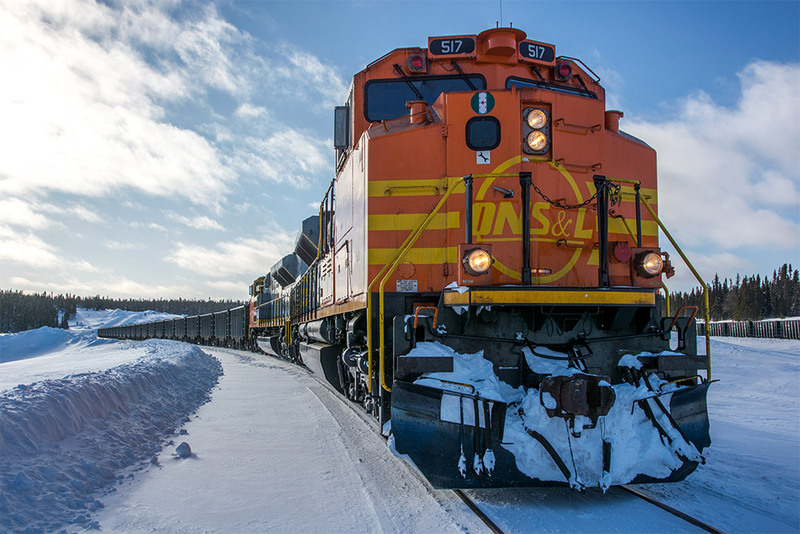 In addition to owning 735 specialized railcars for the transportation of iron ore, the QIO logistics strategy ensures long-term access to some of the world’s largest consumers of iron ore for Bloom Lake’s high-quality product, with transportation agreements already in place with the Quebec North Shore and Labrador Railway Company, Inc. (“QNS&L”) and the Société ferroviaire et portuaire de Pointe-Noire (“SFPPN”). Since acquiring Bloom Lake in April 2016, and successfully delivering a Feasibility Study in March 2017, QIO secured the necessary funding by October 2017, with the participation of its Government of Quebec partners. This enabled QIO to upgrade and optimize the facilities at both the mine and surrounding infrastructure, as well as acquire a stake in SFPPN, the owner and manager of port and logistics assets at Sept-Îles. Ahead of the Bloom Lake restart, QIO was also successful in securing offtake partners and forming mutually beneficial alliances with the host community, including entering into an Impact and Benefits Agreement with the Innu People of Uashat mak Mani-utenam. The technical information in this news release was reviewed and approved by Mr. Hugues Longuépée, P. Geo., Ph.D., a Qualified Person as defined under National Instrument 43-101.